... or so denierbud tries to make believe. In episode 23 of the One Third of the Holocaust video, also viewable on You Tube, denierbud (hereinafter "Bud") undertakes to simulate the incineration of corpses at the Aktion Reinhard(t) (AR) camps in microcosm. He places a thin domestic barbecue grill on concrete pillars 39 cm high, puts a 12 ½ pound leg of lamb on top of the grill and ignites 45 pounds of chopped wood below the lamb, after having sprayed a bit of what he claims is gasoline onto the leg from a water bottle. The first experiment takes place on a beach in the daytime, and it fails because a strong wind blows the flames aside and thus not much heat reaches the leg of lamb, which ignites only a little at the bottom. As the wood burns down, the distance between fire and incineration object becomes bigger; Bud claims that this is why the Hindus lay the bodies of their dead directly on the pyres with nothing in between, so that the body sags as the pyre does. In the evening, the wind gone, Bud repeats the experiment, bringing along 90 pounds of wood for this purpose. This time it works, but only, so Bud tells his viewers, because he tends the fire, regularly adding chunks of wood to keep the flames close to the limb. After about two hours, the incineration is completed. Bud points out that at Treblinka there was no one in charge of tending the fire, the way he did. They also had wind like he had in the daytime experiment, he believes. So, he reckons, the incineration of the murdered victims at the AR camps could not have worked as described by witnesses, and the Germans would never have implemented an incineration system so inefficient. Bud further tells his viewers that on maps of Treblinka – he shows one, obviously taken from Yitzhak Arad’s Belzec, Sobibor, Treblinka. The Operation Reinhard Death Camps – no facilities are shown for storing the enormous amounts of wood he claims would have been required for incinerating the corpses. Several features of Bud’s experiment do not coincide with the conditions under which bodies were burned at the AR camps. 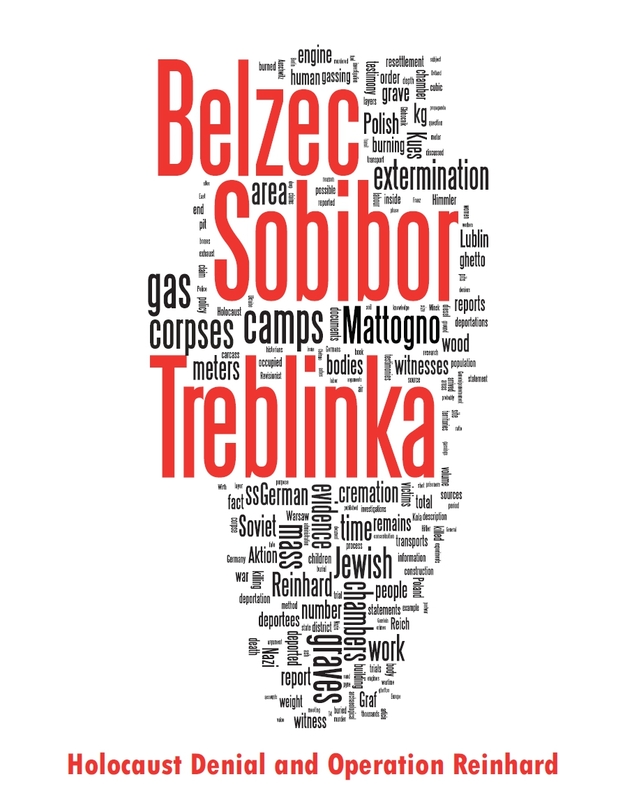 The last camp where the cremation of the corpses was instituted was Treblinka. During Himmler’s visit to the camp at the end of February/beginning of March 1943, he was surprised to find that in Treblinka the corpses of over 700,000 Jews who had been killed there had not yet been cremated. The very fact that the cremation began immediately after his visit makes it more than possible that Himmler, who was very sensitive about the erasure of the crimes committed by Nazi Germany, personally ordered the cremating of the corpses there. A cremation site was erected for this purpose in the extermination area of the camp. Between 2,000 and 2,500 bodies – sometimes up to 3,000 – would be piled on the roaster. When all was ready, dry wood and branches, which had been laid under the roaster, were ignited. The entire construction, with the bodies, was quickly engulfed in fire. The railings would glow from the heat, and the flames would reach a height of up to 10 meters. The bodies of victims brought to Treblinka in transports arriving after the body-burning began were taken directly from the gas chambers to the roasters and were not buried in the ditches. These bodies did not burn as well as those removed from the ditches and had to be sprayed with fuel before they would burn. The body-burning went on day and night. The corpses were transferred and arranged on the roasters during the day; at nightfall they were lit, and they burned throughout the night. When the fire went out, there were only skeletons or scattered bones on the roasters, and piles of ash underneath. The Sobibor roasters, according to the evidence on which the Hagen court based its findings of fact, were inside a pit. A comparison between Leleko’s description and the one contained in the above-mentioned Düsseldorf judgment suggests that the "furnaces" mentioned by Leleko were subdivisions of the pit by concrete blocks placed at certain intervals across the pit, which gave this witness the impression that each part of the pit between its ends and a concrete block or in between concrete blocks, in which fire was burning, was a "furnace". Both the description in the Düsseldorf judgment and Arad’s description suggest that the concrete blocks stood 70 cm above ground, which can be matched with Leleko’s description by assuming that these were either blocks 1.70 meters high placed inside the pit and protruding from the pit for 70 cm, or blocks 70 cm high placed on the rims of the pit, the distance between the bottom of the rails and the bottom of the pit being, in any case, 1.70 meters. 1. Size and configuration of the roaster: At Treblinka, according to the descriptions quoted above, each roaster consisted of railroad rails laid on top of concrete blocks placed inside or on the lateral rims of a pit 1 meter deep, there being a distance of 70 cm between the bottom of the rails and the top of the pit and a distance of 1.70 meters between the bottom of the rails and the bottom of the pit. The facility was 20 meters long according to Leleko, 25 to 30 meters long according to the witness or witnesses on whose testimony the Düsseldorf court based its findings of fact in this respect. I’ll take the mean of the three values, which is 25 meters. How wide the structure was depends on the number of rails making up the grid, their width and the space in between the rails. The measurements of various types of flat bottom rails are given in this table; most of these rails are 125 mm = 12.5 cm wide at the base. If the rails were placed on the concrete blocks according to base width, which seems to be the likeliest configuration, and if the intervals between them were no more than 50 cm, the width of the structure was 2 meters, 2.625 meters or 3.25 meters, depending on whether the grill consisted of four, five or six rails (the differences between Leleko’s number and those of the witness or witnesses on whose testimony the data in the Düsseldorf judgment are based may be due to the fact that the several structures of this kind in operation at Treblinka had different sizes). I’ll use the middle of these three values, 2.625 meters. 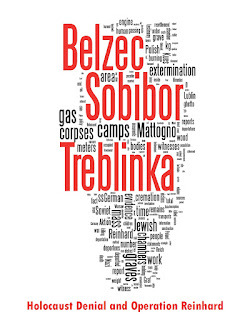 The average area of one roaster at Treblinka would thus be 65.625 square meters, and the volume of space underneath the same about 112 cubic meters. The size of the facility at Sobibor is not known, but according to the Hagen court it was a large pit with a roaster inside it, also consisting of railroad rails. About the Belzec structure not much is known except that it was probably similar to that used at Treblinka. To simulate these huge structures, Bud simply placed a thin domestic barbecue grill over two concrete pillars 39 centimeters high and about (my estimate, as Bud doesn’t provide the data) 1 meter away from each other. How, by what calculations and considerations, did he make sure that a) these structures could be adequately modeled on a reduced scale and b) his arrangement was an adequate scale model of the simulated structures? The length, width and height of the structure, in absolute terms or in relation to the mass to be incinerated, may have an influence on the amount of air circulation, which in turn influences the duration and intensity of the combustion process. The same may be of true of the relation between the structure’s measurements, the number of bars that the grill consists of and the distance between these bars. It may also make a difference whether you use railroad rails, the flat surface of which, once they have been sufficiently heated from underneath, will probably give off a lot of heat, or the thin bars of a domestic grill, which may accumulate and give off heat to a much lesser extent. There’s no indication that Bud took any of these factors into consideration, except for his unsubstantiated claim that the lower height of his grid (in relation to the above-ground height of the Treblinka structure, not considering the pit mentioned by Leleko) is compensated by a relatively much higher amount of corpse/carcass matter burned on the Treblinka grids. Yet he claims to have demonstrated that burning corpses or carcasses on grills over open fires is a conceptually inefficient method, as opposed to placing the corpse directly onto the burning wood pyre as practiced in Hindu funerals. Actually, the latter is a comparatively inefficient and fuel-intensive incineration method, whereas the former can be a highly efficient method of disposing of animal carcasses or human corpses if it is done correctly, the adequate size and configuration of the structure being one factor of a proper arrangement. The source behind this statement is an incineration expert of the early 20th Century, a German engineer by the name of Wilhelm Heepke. This expert’s considerations are quoted at some length in Carlo Mattogno’s otherwise unremarkable article Combustion Experiments with Flesh and Animal Fat, which may be the subject of closer examination in the future (the fallacies of one of Mattogno’s experiments described in this article have been exposed on the Axis History Forum by the poster "Pangea" in his post of 13 Dec 2004 20:35). Engineer Heepke, however, is not responsible for who refers to his writings and conclusions, and what Mattogno has quoted from these is interesting indeed. The simplest procedure is to dig a pit 2.5 m long and 1.5 m wide and deep in the vicinity of the carcass and to fill it almost completely with firewood logs about 1 m long. In order to achieve a good draft, the wood must be stacked lengthwise and crosswise in alternate layers; it must first be soaked in petroleum to ensure good and rapid burning. The easiest way to do this is by means of a narrow pail or bucket filled with petroleum, with both ends of each log being dipped into the liquid. It is also recommended to line the sidewalls of the pit with such logs placed vertically and close together. The carcass will be placed on the pyre with its opened abdomen downwards. A narrow channel of the width of a spade leading upwards at an angle from the bottom of the pit at each short side will allow the pyre to be lit easily; once the fire is lit, the openings of the channels must be closed by means of earth. The fire should develop rapidly, heat loss to the sides is minimal, thus, the heat will be concentrated on the carcass; the latter will progressively sink down into the pit and be completely consumed. During the first hours of the process, it is necessary to add more wood, even though the fat flowing down [from the carcass, transl.] will itself act as fuel for the fire. For the burning of a large carcass of some 250 - 300 kg in weight, using the procedure described above, over a duration of 5 - 6 hours, the fuel requirements will be approx. 2.5 cubic meters of good firewood and 35 liters of petroleum. The average of the above ratios is a ratio of about 3.28 to 1. The average of the above ratios is a ratio of about 4.21 to 1. Fig. 2 shows a better arrangement [see document 1]. The pit is 1.5 m deep, but only 1.0 m wide in its lower part; thus, at a level of 0.75 m, there will be shoulders 0.5 m wide on either side, on which iron beams can be secured. Before placing the carcass on the grid, the bottom of the pit will be covered with a thick layer of straw and highly flammable material and the remainder, up to the level of the rails, filled with the main fuel being used. For an easier inspection of the animal, the free space between the rails will be covered with planks a suitable thickness. Any organs removed, being difficult to ignite, will be placed on the edge of the pit, to be pushed into the pit once combustion has progressed sufficiently. After the autopsy, the planks will simply be pulled away from under the carcass and left in the pit as extra fuel. The animal will then be turned over in such a way that the open abdomen will face downwards, and the straw at the bottom of the pit will be ignited. It can be seen from the experiments described by Heepke that the ratio of fuel to flesh is always less than one; in other words, the combustion of one kilogram of flesh requires less than one kilogram of fuel - more precisely, between 0.39 and 0.80 kilograms of wood. We have to state, though, that the aim of the experiments was only to render hygienically harmless the carcasses of animals that had died from infectious diseases; for this, a more or less complete carbonization was all that was required. That the result was not an incineration, i.e., a complete reduction of the carcass to ash, can be deduced from the fact that Heepke published a table reflecting the practical results of animal incinerators built by the H. Kori company of Berlin (see document 4). The results show that the largest type of equipment of this kind, oven 4b, was able to incinerate 900 kg of flesh in 12 1/2 hours using 300 kg of hard coal. This fuel has a heating value 2.5 times that of ordinary wood; hence, such an oven would have required as much or even more wood than a burning pit - which is obviously impossible. The use of accelerants such as diesel fuel, or auxiliary fuels such as wood and straw is required to achieve the combustion temperatures necessary for the complete destruction of animal carcasses. According to the January 2005 TAHC Report, fixed whole carcass incineration, in which «whole carcasses or carcass portions can be completely burned and reduced to ash», leads to effective inactivation of pathogens (page 7), whereas pyre burning is considered problematic because it «has no verification of pathogen inactivation» and carries a possibility of «particulate transmission from incomplete combustion» (page 8). These sources obviously would not consider mere carbonization as sufficient to «render hygienically harmless the carcasses of animals that had died from infectious diseases», and Mattogno has not produced a contemporary source showing that animal health requirements were less stringent in Germany in the early 20th Century. Carcasses can be incinerated (burned) in different ways including: Open-air: burning carcasses in open fields on flammable heaps (pyres).Pits: the confined space of a pits helps prevent the fire from spreading to other areas. Because the carcasses are not exposed to as much air (open-air burning), extra fuel or air must be added to the pits to help the fire stay lit. At any rate, we can conclude that burning corpses or carcasses on an iron grid structure is by no means the conceptually inefficient method as which Bud presents it. On the contrary, it was a widely used method for disposing of carcasses in engineer Heepke’s time, and with a proper arrangement and procedure it was also an efficient, fuel-saving method. Bud having sprayed "gasoline" onto the leg of lamb, and again there is also no mention of the wood underneath the grid having been doused with gasoline. Bud lets his chopped-wood logs placidly burn under the grill and waits for the flames and heat from these burning logs to consume his leg of lamb; he claims that, in his nighttime experiment, the leg of lamb, which has obviously ignited already, would stop burning were it not for the fire underneath. This seems somewhat dubious if you look at the flames emerging from the burning meat, and this viewer also had the impression that, in the nighttime experiment, most of the flames were not even needed to burn the leg of lamb, but burned idly into the night. Would this have been the way in which official veterinarians Dr. Lothes and Dr. Profé of Cologne conducted their cattle burning experiments with the grid burning methods described by engineer Heepke, in which they managed to incinerate their objects with an average of 0.55 to 0.50 kg of fuel per kg of carcass? I don’t think so. The efficiency of burning a carcass on an iron grid seems to depend on causing a huge, blazing, hot flame from below to evaporate the moisture inside the carcass and ignite the same as quickly as possible, after which the burning will be dependent to a lesser degree on the flames coming up from the external fuel and rely mainly on air circulation, the carcass’s own combustion properties and the heat of the iron grid. Accordingly Heepke is very specific in recommending the use of «a thick layer of straw and highly flammable material» at the bottom of the pit for the method he considers most adequate, the apparent intention behind this being to obtain a rapidly developing, strongly burning fire. The SS at Treblinka proceeded more or less in this manner: they didn’t have straw but they must have had plenty of dry brushwood, from constant renewals of the camp fences’ camouflage cover plus what they kept cutting in the nearby woods, and they doused it in petrol to provide for what eyewitnesses described as a blazing, almost explosive flame, quickly engulfing the bodies and igniting them. In order to further help and speed up the ignition of those corpses that were difficult to burn, the ones of people incinerated right after gassing, they furthermore poured liquid fuel onto the corpses, a method that Heepke doesn’t mention. Whether they also used larger firewood in addition to the brushwood is unclear; some witnesses apparently mention it whereas others (e.g. Matthes and Reichmann, see above quote) do not. What neither the SS at Treblinka nor the veterinary doctors applying the methods described by Heepke did, however, was to make a nice, tended camp fire underneath the grids and wait for the corpses to be consumed thereby. Both the SS at Treblinka and veterinarians Dr. Lothes and Dr. Profé of Cologne rather strove to quickly reach a point at which the corpses or carcasses themselves would ignite and after which the corpses or carcasses would more or less sustain their own combustion. Note that in regard to the grid burning experiments, unlike in his description of the "simplest procedure" of burning the carcass directly on a pyre, Heepke doesn’t mention the addition of any fuel to the initial amount once the burning process is under way. Further corroboration of the functionality of the grid burning method applied at the AR camps comes from one occasion in which the same method was applied, albeit with smaller grids and on a comparatively reduced scale, for body disposal in the aftermath of a bombing attack. Of the victims of the bombing of Dresden by the British and American air forces on 13/14 February 1945, a total of 6,865 were burned on one of the city’s squares, the Altmarkt, on roasters made of steel girders. Unlike is the case with the incineration grids of the AR camps, of which no photographic evidence is known, there are several photographs of these Dresden grids. This very graphic picture from the German Historical Museum shows mangled bodies of victims of the Dresden bombing heaped upon a grid prior to incineration. This also very graphic picture gives an idea of the configuration and size of the grid. 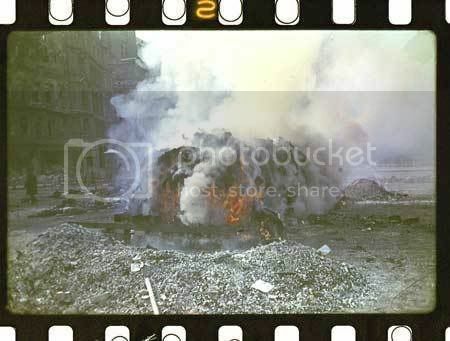 This picture from an article featured on David Irving’s website shows an incineration grid while burning, with what looks like heaps of ashes and bone fragments from a previous incineration in front of it. The whole of the city centre around the Altmarkt had already been cordoned off. relatives who stumbled across the still-impassable streets of the inner city were waved away by police and Party officials. Wagon loads of corpses were now being driven to the frontiers of this cordoned area by SHD and forced labourers, and there handed over to army drivers and officers. The wagons were driven on to the centre of the Altmarkt, and there their terrible loads were tipped onto the cobbled paving. Scores of police officials were at work here, making last efforts to identify the people, and sworn to secrecy about what was happening. The Steel girders had been winched out of the ruins of the Renner department store on the Altmarkt and these had been laid across crudely collected piles of sandstone blocks. A gigantic grill over twenty-feet long was being erected. Under the steel girders and bars were poked bundles of wood and straw. On top of the grill were heaped the corpses, four or five hundred at a time, with more straw between each layer. The soldiers trampled up and down on top of this rotting heap, straightening the victims, trying to make room for more, and carefully building the stack. Many of the dead children sandwiched into these terrible pyres were still wearing the colourful carnival clothes that they had donned so eagerly two weeks before. Finally gallons of gasoline, sorely needed though it was throughout the whole Reich, were poured over the stacks of victims. A senior officer cleared the Altmarkt square of all unnecessary by-standers, and set a match to the heap. Once again thick black smoke coiled up from the centre of the Dresden Altmarkt—as it had two weeks before, and as it had indeed in 1349: history records how almost six hundred years earlier the Margrave of Meissen, Frederick II, had had his enemies burned at the stake here in the Altmarkt; they were the Jews, accused of introducing the Plague. By a cruel coincidence the burning had also fallen on Shrove Tuesday carnival day. In the late hours of the evening the grill was re-erected over a different part of the square. Nazi Party officials saw to it that the ashes and charred bones were collected and taken to the cemeteries to be buried too. The result of this incineration process was clearly ashes, according to Irving, not just carbonized corpses. Assuming that each of these 6,865 dead bodies weighed 50 kg on average, all corpses burned on the Altmarkt weighed 343,250 kg or 343.25 tons. The minimum weight of the ash, according to Carlo Mattogno’s calculations quoted in section 4.5 of my article Carlo Mattogno on Belzec Archaeological Research, would have been 5 % hereof or ca. 17.2 tons, corresponding to twice that many (34.4) cubic meters of ash. Ten trucks is too much for that even if they are only 3-ton trucks, so either Irving or his source exaggerated, or more trucks than absolutely necessary were used, or the bodies were burned into more coarse ashes than in Mattogno’s meat burning experiment underlying his 5 % figure. The measurements of the pit described by Irving were 25 x 16 feet or roughly 8 x 5 meters = 40 square meters. If the pit was as deep as a normal grave, i.e. ca. 2 meters, then the ashes would fill up less or more than half of that pit, depending on how thorough the incineration was, the remainder of the pit’s contents being soil. Now, if we look at Irving’s description of the grid and the procedure, we see that it is about the same as the description of the grids at Treblinka, except that the latter were bigger and had a pit underneath. Just like at Treblinka, solid flammables were placed under the grid for igniting the bodies (except that there is no mention of the wood and straw being doused with gasoline at Dresden). Just like at Treblinka (at least in what concerns the "fresh" bodies burned right after gassing, as opposed to the decomposed corpses taken out of the mass graves), liquid fuel was poured over the bodies to make them burn. Irving’s description suggests huge amounts of gasoline, and there’s no reason to assume that they didn’t use a lot of gasoline, even more because the grids were bigger, at Treblinka as well. 1945 burial of thousands of victims of the bombing attack, including burial of the ashes of the dead burned on the Altmarkt. In 1943/44 the burial of tens of thousands of civilian war victims is also prepared in Dresden, the city so far largely spared by bombing attacks. Starting at the ceremony square, eight mass grave fields are reserved on an area of 7,900 m². Ash remains of non-identifiable victims are to be buried in a special grave at the end of the axial area. The planning also shows a new quality insofar as the bombing victims are not to be buried individually at their relatives’ request, as had been done so far – for instance after the air attack on 7.10.1944. This planning, which refutes the myth of the completely surprising destruction of Dresden, proves to be necessary to a shattering extent. Dresden is largely destroyed by an area bombardment in the night of 13 to 14 February 1945. The dead, about the number of which there are differing data to this day,287 are generally buried without coffins in the foreseen mass graves. Due to the threat of epidemics, another 6868 dead are burned on a pyre on the Altmarkt, and the ashes – also as foreseen – are buried at the end of the axis. Fibich’s dissertation confirms the existence of a mass grave at the Heidefriedhof cemetery, mentioned by Irving, in which the remains of the victims burned on the Altmarkt were buried. Like the previously quoted description of this cemetery, it also matches Irving’s description of these remains as having been ashes. Further corroboration of Irving’s description comes from British historian Frederick Taylor, who addresses the Altmarkt incinerations on pages 350 f. and 447 of his 2004 book Dresden: Tuesday, Feb. 13, 1945. Emphases in the following quotes from Taylor’s book are mine. After the idea of burying them instead in the city parks was abandoned for public health reasons, a drastic but effective solution was found. Instead of carting and trucking corpses out of the cemetery, the dead from the streets and cellars of the Altstadt were transported to the great expanse of the Altmarkt, where flower markets had once been a famous feature, and less than five years earlier bands had played and vast crowds had cheered Dresden’s Fourth Infantry Regiment as it returned from the war against the French, apparently victorious. A more terrible contrast than the scenes that commenced on February 21 could not be imagined. The great water tank built in the previous winter in the Altmarkt to supply the fire service had itself filled with the drowned and boiled bodies of those who had mistakenly sought refuge there. Once those were cleared, and rubble swept, the square was sealed off. Then began the work. Corpses were shipped in and laid out ready for registration and, if possible, identification. Searching for ways of keeping them off the ground – and allowing a draft under the planned funeral pyres – workers found a solution in the wreck of a nearby department store, where massive window shutters had survived the bombing. They carried them from the ruins and set them down on the ground, making, as a contemporary grimly expressed it, "huge grill racks." In 1993, however, four years after the collapse of communism, documents from the municipal cemetery office were found in the Dresden City Archive. These provided, for the first time, a detailed official breakdown of how many bodies had been buried by the Dresden authorities after the raid, and where. The burials had been undertaken with great thoroughness (like almost everything else associated with the aftermath of the Dresden raid) and totals reported regularly to the city authorities. The total buried in the Heidefriedhof between February and the end of April 1945 turned out to have been 17,295, including the ashes of the incinerated victims from the Altmarkt. Taylor’s description differs from those of Irving and Fibich in that it mentions several pits (and not just one) into which the ashes of the incinerated bodies were dumped. It also mentions an estimate of an amount of ashes that is significantly lower than that suggested by Irving’s description and my calculations based on Mattogno’s experimental data – this may be related to the fact that who made the estimate did not see the ashes of all incinerations on the Altmarkt, as a part thereof had already been taken to the cemetery. On the other hand, Taylor's description confirms the method described by Irving, the use of high amounts of gasoline for the incineration, the secrecy surrounding the operation and the attempts made to identify the victims prior to incineration; the latter two factors may have been one reason, besides the lack of material required to build more and bigger grids and the time it took to get bodies dug out from under he ruins to the place of burning, why the incinerations on the Altmarkt were carried out at a rate of only 500 per day. Taylor’s description of how the remains left over after incineration were packed into boxes or sacks and from there dumped into pits leaves no room for doubt that these remains were ashes – Taylor even describes them as "fine" ashes and points out the efficiency of the incineration process. His account also highlights the importance of «allowing a draft under the mass funeral pyres», which was the reason for implementing the grid structure. Last but not least, Taylor mentions the probable presence of SS-experts from Treblinka extermination camp, which seems plausible considering the similarity between the incineration procedure adopted on a much larger scale at Treblinka and that applied at Dresden. It stands to reason that people with experience in building such structures and incinerating bodies on them would be called in to handle the Dresden emergency, and who better for this purpose than former SS-staff of Treblinka? The presence of such experts, incidentally, was also mentioned by German historian Wolfgang Scheffler in a roundtable discussion published in the 1979 book Im Kreuzfeuer: Der Fernsehfilm Holocaust, edited by Peter Märthesheimer and Ivo Frenzel, Fischer Taschenbuch Verlag Franfurt am Main. On page 271 of that book, Scheffler mentions that the incinerations on the Altmarkt were partially carried out by Ukrainian auxiliaries who, as members of the Streibel battalion from Trawniki, had previously carried out similar tasks in extermination camps. According to both Irving and Taylor, the bodies were reduced to ashes using a method very similar to that applied at the AR camps, which involved a grid structure and the use of high amounts of liquid fuel; Irving additionally mentions wood and straw underneath the grid and straw in between the bodies, while Taylor highlights the importance of the draft provided for by the grid structure. All sources consulted confirm the efficient incineration of almost 7,000 dead bodies on the Dresden Altmarkt in the sequence of the air attack on 13/14 February 1945. This, in turn, further supports the conclusion that corpses or carcasses can be efficiently burned on an open-air grid structure, and that an adequate amount of highly flammable material, namely solids like straw or brushwood and liquid fuel like gasoline, is an essential factor for effectively burning corpses or carcasses on a grid. 3. Object to be incinerated: Bud incinerated a single leg of lamb in his nighttime experiment, probably using at least as much of his huge camp fire to warm himself and to lighten up the night as he did to incinerate meat and bone on his grill. He used up to 90 pounds of wood to incinerate 12 ½ pounds of lamb (the 45 pounds used for the daytime experiment don’t count, as the flames barely touched the incineration object) – a rather inefficient fuel weight to carcass weight - ratio of 7.2 to 1. Dr. Lothes and Dr. Profé of Cologne managed an average ratio of 0.55 to 1 in their "A" grid burning trials shown in Heepke’s Table I. In order to compare their results with Bud’s one must take into account that they also used brown coal, which they stated to have about 1 1/3 times the heating value of wood; taking this factor into account would raise the fuel-to-carcass ratio from 0.46 to 0.54 in trial I and from 0.39 to 0.46 in trial II, while in trial III it would remain at 0.8 as only wood was used there; the differences in heating value between the wood and the liquid fuels assisting the incineration in all three trials (tar in trials I and III, resin in trial II) were not taken into account and would raise the ratio if they had been. Yet even in these comparatively inefficient experiments, Lothes and Profé used at least 7 times less fuel in relation to carcass weight than Bud in his camp fire grill experiment. In the more efficient trials of category "B", trials IV, V and VI, using only wood and – in trials V and VI – a low amount of tar, Dr. Lothes and Dr. Profé managed ratios of, respectively 0.40, 0.56 and 0.55, the average being 0.50 or about 14 times less the wood used in Bud’s nighttime experiment. So clearly the differences between Bud’s campfire and the experiments conducted by Lothes and Profé have an influence on the fuel efficiency. Some of these differences have been discussed under items 1 and 2 above; another difference probably lies in the fact that Lothes and Profé incinerated whole carcasses, with the distribution between bones, fatty tissues and muscles characteristic of the respective species, rather than a relatively fat-poor part of one carcass, as Bud did. The Treblinka incineration grids, as we have seen, had probably an area ca. 66 square meters on average. The space underneath the grid available for placing brushwood and other wood, considering both the depth of the pit and the above-ground height of the concrete blocks, was about 112 cubic meters, which corresponds to ca. 30.9 cords of wood. If there were a thousand decomposed bodies on the grid, weighing 25 kg on average (calculations see here), if they were incinerated in a single run, and if the wood used was pinewood, the kind that grew in the Treblinka area and may also have been felled in lumber-working labor camps supplying Treblinka, the wood-to-corpse ratio, taking the data for dry Jeffery pine given on this site, would have been 1.41:1 at maximum (i.e. assuming the higher value of the weight range given for this type of wood). With 1,000 non-decomposed corpses on the grid (average weight 35 kg, according to my calculations) it would have been 1.01:1 at most. With 2,000 corpses it would have been 0.71:1 or 0.50:1, depending on whether the corpses were decomposed or non-decomposed ones. The former rate would be better than the one achieved in trial III of Heepke’s Table I, while the latter would be close to the average result achieved by Dr. Lothes and Dr. Profé in their trials identified as IV, V and VI in Heepke's table. With 3,000 decomposed corpses, the ratio would be 0.47:1, better (considering the heating value conversions for non-wood flammables I made above) than the result achieved in trial I according to Heepke’s table, and almost as good as the result of trial II. The incineration of 3,000 non-decomposed corpses, finally, would mean a ratio of 0.34:1, i.e. an improvement over the most fuel-economic result achieved by Lothes and Profé, that of trial IV. To be sure, this was mass incineration, the corpses (at least the non-decomposed ones) were arranged in a particular manner (corpses with a large fat content at the bottom layer on the grid), the non-decomposed corpses were probably bathed in gasoline in order to help them burn (like at Dresden after the attack on 13/14 February 1945, see above), and the decomposed corpses, as explained here, burned rather easily due to their dehydration and/or the flammable substances generated during the decomposition process. These wood-saving factors were not attributable to the arrangement of the incineration structure, so that it cannot be said that its inventor, SS Oberscharführer or Hauptscharführer [Herbert] Floss, managed to outperform Dr. Lothes and Dr. Profé. Besides, 3,000 non-decomposed corpses on a grid seems unlikely, even assuming that the average deportee to Treblinka occupied only ca. 47.5 ÷ 703 = 0.07 cubic meters, as in Provan’s experiment; the height of the pile of corpses would have to be 3,000 * 0.07 ÷ 66 = 3.18 meters. If the pile of corpses was about 2 meters high, as described by eyewitnesses, the most that could fit on a grid with an area of 66 square meters would be 66 * 2 ÷ 0.07 = 1,886 non-decomposed corpses. The number of decomposed corpses that could be placed on such a grid would be considerably higher if they were already in the advanced stages of decomposition at which, as explained here, the corpse generally dehydrates completely. Notwithstanding these restrictions, however, it seems fair to conclude that the combination of several factors – a grid arrangement providing for considerable air circulation, the use of adequate amounts of highly flammable accelerants, a large mass of organic matter incinerated at the same time, and the combustion properties of that matter, especially the decomposed, largely dehydrated corpses – made it possible to incinerate hundreds of thousands of corpses at each of the AR camps using relatively modest amounts of wood. It is not improbable that the burning of the corpses at Treblinka made do with ca. 30.9 cords or 35.3 tons of pine wood per grid incineration, which, even assuming 750 grid incinerations with an average of just 1,000 corpses each, would mean no more than 26,475 tons of wood for the whole process – plus, of course, an enormous amount of precious gasoline. Assuming ca. 700,000 decomposed corpses weighing 25 kg on average and 50,000 non-decomposed corpses weighing 35 kg on average, the overall wood weight to corpse weight - ratio would be 26,475,000 kg ÷ 19,250,000 kg = 1.38:1, approaching the lower range of the calculations in section 4.2 of my article Carlo Mattogno on Belzec Archaeological Research. 4. Wind: What influence did wind have on the corpse incineration process at the AR camps? Bud’s failed daytime experiment was conducted on a rather windy beach, and the wind, blowing the flames away from the grill, was what caused this experiment to fail; the wood burned down idly with the flames barely touching the object to be incinerated. Did incineration at the AR camps face similar problems? While Bud claims, referring to a passage in Arad’s book (page 177) mentioning spring winds, that wind conditions at the AR camps were the same as in his experiment, I’m not sure if spring winds in a wooded area in Poland can be compared with the strong wind that was obviously blowing on a California beach on the day of Bud’s experiment. What is more, the incineration at Treblinka largely or mostly occurred at night, according to my above quote from Arad’s book; wind conditions are therefore more likely to have been like those that Bud encountered in his nighttime experiment. Wind would anyway not greatly affect the efficiency of the burning process at Sobibor if, as stated in the Hagen court’s judgment, the fire burned inside a pit, sheltered from the wind; this wind protection is a factor that, according to Heepke, was instrumental in making the "B" trials (IV to VI) shown in his Table I more successful than the "A" trials (I to III). The Treblinka structures, as already mentioned, were more similar to those in Heepke’s "A" trials, and there’s no evidence to some kind of wind protection being implemented at Treblinka. Does this mean that corpse incineration at Treblinka was less efficient than at Sobibor? Not necessarily, if one takes into account the better air circulation that may have resulted from the space between the grid and the top of the pit and the sheer size of these structures, which were much bigger than what Dr. Lothes and Dr. Profé of Cologne worked with in the experiments mentioned by Heepke. Wind, as is well known, will fan rather than hinder a huge fire, and a blazing flame engulfing an area of 66 square meters and reaching to a height of up to ten meters, which is how the fires of the Treblinka grids were described by eyewitnesses, would hardly be blown away from the object of incineration the way that Bud’s small camp fire was blown away from the leg of lamb by the beach wind. So we can see that Bud’s camp fire experiments have not much in common with properly conducted open-air carcass incineration on an iron grid let alone with the mass incinerations of murdered human beings at the AR camps. To clear the woods around the perimeter of the camp – that’s our main task now. Felled trees are hauled into camp and chopped into firewood. As spring becomes summer without transports, the greatest concentration of activity in the first camp moves down to the grounds behind the Ukrainian barracks, to the lumberyard. Those of us from Barracks A work there, along with other commando units who had previously worked at the sorting site. Idyllic mounds of freshly sawn and split firewood grow up and shine out from among the towering pines that have not been felled. A path runs along one side of the lumberyard and leads up to the main gate of the second camp. Though it is some seventy meters away, the gate is clearly visible from our work site. Here we deliver what wood is needed in that part of the camp. No one from over there is allowed out to work by the SS. The main work in the second camp still consists of digging up and incinerating the bodies from old transports. This map of Treblinka extermination camp in August 1943, drawn by Peter Laponder, shows a timber store and yard (item 20 a) next to the Death Camp sector of Treblinka. A special group known as the forest team, which numbered a few dozen prisoners, was set up to cut wood for heating and cooking in the camp. It was put to work in the forests near the camp. When the cremation of the corpses started, this team was enlarged, for it also had to supply the wood for the bonfires on which the corpses were burned. The size of the wood storage facilities is not necessarily shown correctly on maps of Treblinka based on eyewitness testimony, even on such that are drawn to scale. It is also not a given that the SS kept much wood on storage rather than having it cut on a regular basis according to requirements, except probably for the brushwood that must have kept piling up throughout the period of the camp’s operation from the constant renewal of the barbed wire fences’ camouflage cover. Neither was the wood cut in the forests around the camp necessarily the only that was used for burning the corpses on the roasters; additional wood from labor camps dedicated to wood-felling may have been brought in by rail or truck. However, the above sources about the camp’s woodcutting activities and wood storage facilities or areas are sufficient to show, once more, that Bud’s "research" has as little to do with proper research as his camp fire experiments have got in common with proper incineration of carcasses on iron grids or with the mass incinerations of corpses at Treblinka and the other AR camps. Thanks to Sergey for his valuable criticism and input, namely in regard to the Dresden incinerations. I would also like to thank my friend Dr. Eng. Carlos Silva from the Portuguese Instituto Superior Técnico for our conversations about the requirements of scientific modeling, which helped me to better understand the fallacies of the video maker’s approach. Last but not least, I thank Peter Laponder for kindly making available information about his Treblinka model that was very valuable to the making of this article. >More poorly understood Roberto pseudo-science. Yeah, you tried to sell me that idea before, didn’t you, Mr. L? >If wind is such a precious factor, rain is even more so. Quite a lot of rain in that part of >Poland. Not as much as you would like to, and that will be addressed in my forthcoming article about clip # 15. One thing at a time. >However, taking your figure of 26,475 tons of wood, lets make a generous assumption that >each tree generated a ton of wood, at lets forget about all the cooking and heating >requirements of that camp and the camp down the road. >Can you point out on the aerial photos in the vicinity of Treblinka this 26 473 trees came >from? Did the wood necessarily have to come from the neighborhood alone, or did I say so? As we’re at it, my wood calculations may be on the high side. Just think about how much wood they could have put under the grid at the Dresden Altmarkt for each lot of 500 dead bodies. >No? Oh well you had better delete this comment then. I won’t, but somebody else may do that. Not because of the contents, but because you are an unwanted person here, as you know.